I don't mind sprinkles... or jimmies. They add to the festive aspect of indulging in donuts sometimes for me. Since they don't contribute much to the flavor (maybe a bit to the texture) I think they're all about "eating with your eyes" before you eat with your mouth. They kind of scream "you're about to eat something fun!!!" Around here "Boston cream" usually has a sort of yellowish tint to it. The "Manager's Special" filling is more white, but it's definitely not whipped cream or the cream they usually put in "cream-filled doughnuts. By itself the "Manager's Special" filling is not particularly appetizing looking, but it has a pronounced vanilla flavor. They make it more like a party. They make a box of donuts look awfully pretty. we might possibly call it "New-Variant Boston Cream with Jimmies"
I personally can't stand those tiny little candy spheres that make up non-pareils. They're not exactly edible, and they make my teeth hurt, they're so sweet. I like those on sugar cookies. I like them too, but they are messy. They are always falling off and then rolling around on the floor. But they sure are good! Tell you what. 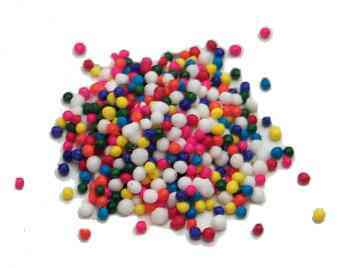 Aren't non-pareils spherical and jimmies usually oblong?